Join the NC High Peaks Trail Association as the club holds its annual meeting at the Yancey County Library on Saturday October 6 starting at 10 a.m. Light refreshments will be served. The meeting will end by noon. Our special guest this year will be award-winning writer and guidebook author Randy Johnson. Randy will be speaking about the importance of volunteers and volunteer organizations like NC High Peaks in preserving outdoor recreation opportunities for users and user groups. Randy was the first backcountry manager at Grandfather Mountain working under its owner Hugh Morton. Randy's work there preserved the original trail network created by Clyde Smith and his Blowing Rock Boy Scout troop and later expanded it by creating the Cragway, Nuwati, and Profile Trails on the mountain. Randy is the author of many guidebooks, beginning with Southern Snow, a Guide to Skiing in Dixie and most recently, Grandfather Mountain, the History and Guide to an Appalachian Icon. Randy is an avid hiker, backpacker, and backcountry skier. Other speakers will review the past year’s activities and outline plans for the coming months. Four Board members will be elected from a slate proposed by a committee, although members may also nominate candidates at the meeting. Current members are eligible to vote in the election. Go to http://nchighpeaks.org/join or http://nchighpeaks.org/renew if you need to join for 2019. Founded in 2010, High Peaks supports outdoor recreation in our area by leading monthly hikes and doing extensive trail maintenance work in a partnership with the U.S. Forest Service, the Blue Ridge Parkway and Mt. Mitchell State Park. For more information visit the club’s Facebook page or website, www.nchighpeaks.org. 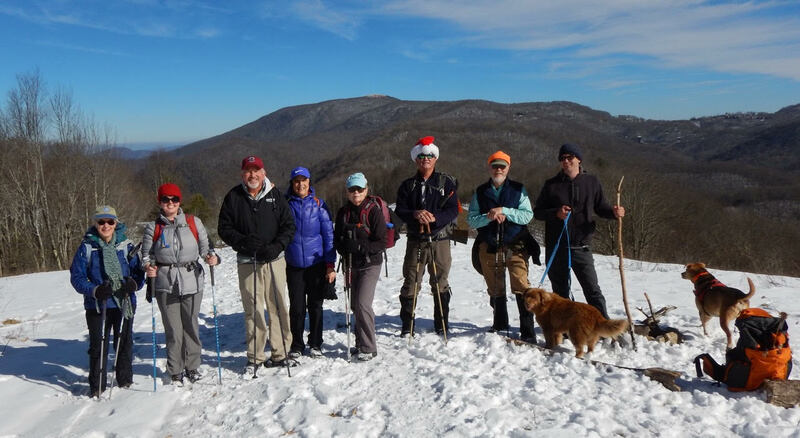 Photo Info: High Peaks leads fun hikes like this one year-round, while also doing trail maintenance work and promoting outdoor recreation in Yancey County. Join the club for its annual meeting Oct. 6 at the Yancey Public Library.